The de Havilland DH.104 Dove was a British monoplane short-haul airliner from de Havilland, the successor to the biplane de Havilland Dragon Rapide and was one of Britain's most successful post-war civil designs. The design came about from the Brabazon Committee report which called for a British designed short-haul feeder for airlines. Production of the Dove and its variants totalled 542 including 127 military Devon C.2s and 13 Sea Devons, the last example being delivered in 1967. The Dove first flew on 25 September 1945. Dove 1: Light transport aircraft, seating up to 11-passengers. Powered by two 340-hp (254-kW) De Havilland Gipsy Queen 70-4 piston engines. Dove 1B: Dove Mk 1 aircraft, fitted with two 380-hp (283-kW) Gipsy Queen 70-2 piston engines. Dove 2: Executive transport version, seating up to six passengers. Powered by two 340-hp (254-kW) Gipsy Queen piston engines. Dove 2B: Dove Mk 2 aircraft, fitted with two 380-hp (283-kW) Gipsy Queen 70-2 piston engines. Dove 3: Proposed high-altitude survey version. Not built. Dove 4: Military transport and communication version. Devon C Mk 1: Transport and communication version for the RAF. Devon C Mk 2: Transport and communications version for the RAF. Re-engined version of the Devon C Mk 1. Sea Devon C Mk 20: Transport and communications version for the Royal Navy. Dove 5: The Dove 5 was powered by more powerful engines. The aircraft was fitted with two 380-hp (283-kW) Gipsy Queen 70-2 piston engines. Dove 6: Executive transport aircraft. Uprated version of the Dove 2, powered by two 380-hp (283-kW) Gipsy Queen 70-2 piston engines. Dove 6B: Stressed for operations at a maximum weight of 8,500lb (3856kg). Dove 7: Uprated version of the Dove 1, fitted with two 400-hp (298-kW) Gipsy Queen 70-3 piston engines. Dove 8: Uprated version of the Dove 2, fitted with two 400-hp (298-kW) Gipsy Queen 70-3 piston engines. Dove 8A: Five seater version of the Dove 8 for the U.S. market. The Dove Custom 600 was an American designation of the Dove 8A. 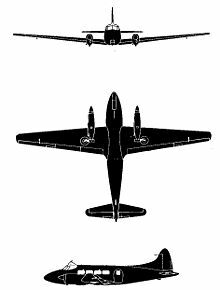 Carstedt Jet Liner 600: Conversions of the Dove, carried out by Carstedt Inc, of Long Beach, California, USA. 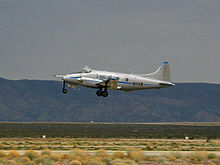 The aircraft were fitted with two 605-ehp (451-kW) Garrett AiResearch TPE331 turboprop engines. The fuselage was lengthened to accommodate 18 passengers. Riley Turbo Executive 400: Conversions of the Dove, carried out by Riley Aircraft in the USA. The aircraft were fitted with two 400-hp (298-kW) Lycoming IO-720-A1A flat-eight piston engines. Some of the Riley conversions were fitted with a taller swept vertical fin and rudder.